We have struggled against the conditions that result in shack fires for more than ten years. We have made progress in some areas. When we formed our movement, the eThekwini Municipality had a policy against electrifying shack settlements. Through struggle that policy was overturned. However the process of electrifying the shacks is too slow. Therefore people resort to other measures in order to keep themselves warm during winter, to cook safely, to be able to watch TV and to have light to study. Electricity is life. For as long as we continue to be denied electricity peoples’ connections will remain necessary. We stand for people’s connections that are made carefully and safely in a well organised way and without any profit motive. In more than ten years of struggle, we have experienced a lot of shack fires. We have lost many lives during these fires. From the beginning, the politics of fire was an important part of our struggle. In 2005 one of our own comrades Zodwa Nsibande sustained serious injuries and nearly lost her life in a shack fire. At the time she was a second year IT student at Durban Computer College. She had to drop out as a result of the severe wounds that she sustained during the fire. In 2006 Mhlengi Khumalo, who was one year old, lost his life in Kennedy Road Settlement. In 2007 we were attacked by the police while protesting against the conditions that lead to shack fires. In 2008 we organised a city wide shack fire summit and produced a report on shack fires. 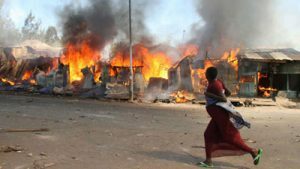 This article was posted on Tuesday, July 5th, 2016 at 10:59am and is filed under Activism, Housing/Homelessness, Poverty, Security, South Africa.